What is your life? It is but a vapor that appeareth for a short time then vanisheth away. For my ways are not your ways and my thoughts are not your thoughts. It was a Saturday in July; my wife came into our bedroom crying…While I'm not the sharpest knife in the drawer, I knew that meant only one thing, we were going to have a baby. This was not our first. This was in fact our fifth. We were very content with our family of four, but well now the truth that we would be having five was before us. As she cried, I laughed. She was not opposed to having another; just the pregnancies kept getting worse and worse. I was not opposed to another; we just decided we were done at four. God wanted five for us. Already, people's eyes popped when they discovered we had 4 that were 6 and under; what would they do when it was 5 that were 8 and down? My wife and I went from surprised to excited, knowing full well that God would provide the needs we had for this pregnancy, as all maternity and many baby clothes went at the rummage sale just 4 weeks earlier, just as He had done in the past with all the others. More excited than Mom and I, and grandma and grandpa, were the four kids who were going to be getting a baby. My daughter begged for a girl, so she could have a sister, while the boys maintained they wanted a brother. Then here we were, the Wednesday before Thanksgiving when we found out that #5 would be a boy. Cami, all of 4, broke out in tears, and her brothers not really trying to console her let her know they were glad it was a boy. She, explaining the reasoning behind her grief, stated that they did not understand, “you guys already have a baby in your room. I WANT ONE IN MINE,” complete with her voice raised and foot stomped. My wife and I exchanged glances, trying to avoid eye contact with the ultrasound tech; and in our eyes, we asked each other if the day would come when the kids would not embarrass us any more. The holidays flew by, and the worst winter in many years came to visit. My poor wife was getting more and more uncomfortable as those dreary months past. Our little boy that she was carrying was not cooperating at all. Seems he was breech, and may need to be delivered caesarean. By the next ultrasound he had turned. Then the day came, or so we thought. The contractions were steady but nope, not tonight. We were sent home. I remember very little other than my wife telling me that by the 5th kid she should have it figured out, and she is not going back there till she cannot stand. I ended those thoughts promptly. This was one dad who was not helping deliver a baby outside of the security of the Birthing Center. I didn't care if we had 30 false alarms. Birthing babies is not my forte. AHHH…. Spring time in Wisconsin. You just have to love it. The record snowfall had melted, and for the most part the ground was open, yet one time a year, under normal circumstances our basement will flood. Thursday, April 10th was that day. It was raining sideways. Water was springing up from cracks in the floor of the foundation. I was bailing 30 gallons of water every 15 minutes…and I hear my dear wife say, “Ooooo that was a hard contraction, way worse then the other night.” I am afraid the look I gave her that time was not a loving one. Finally 8:30 that night we went to the hospital. Now with it being only 4 blocks from my home, I was driving between the hospital and home to keep up on our basement. Jan, the best nurse ever, was with Jenny, and I knew we still had time. With the contractions, the heartbeat was fluctuating. Because of this, they felt the cord could be wrapped, and they were admitting us. There were no other words that offered comfort, relief, and joy like those words of “we are keeping you this time” did. My wife labored through the night and into the morning. The baby would not come. They continued monitoring. The doctors told us we may need a c-section and at 2 that afternoon, she was being rushed down the hall. Our baby boy, Carl was born cesarean, but healthy. His cord was indeed wrapped around his leg, and that was giving us the trouble. 6 lbs. 14 oz, 20 inches long, “my smallest baby and I couldn't get him out,” my wife muttered, but was so glad it was over. 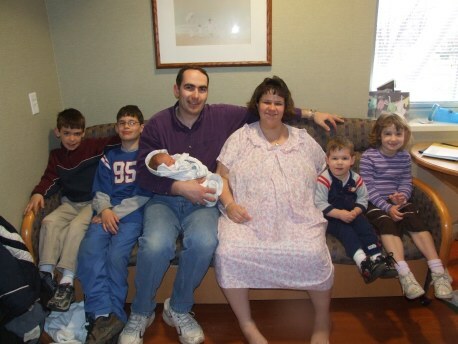 Later, Jenny was back in the room, and the kids met their little brother. All of them loved him; all were so proud. Little Carl was such a good baby. He ate and slept, slept and ate, and grew! Now he was starting to see his hands and follow his Mom. I would come home at night and Jenny would lay him in my arm and Carl and I would sleep on the sofa. The kids would get up and come to Carl first. They all loved him so much. He would lie on the floor and watch his toys. He would coo at you when you cooed to him. He loved to look at colorful things and when you played with him; he would display a contagious belly laugh. He did not like car rides. July 4th weekend he screamed for 3 hours while stuck in traffic, with mom and kids, Uncle John and Aunt Katie. Carl was a gift. He brought joy to all, but Carl was not ours to keep. 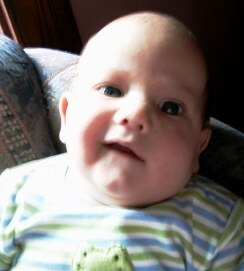 On Friday, July 18, 2008, I laid Carl down for his morning nap, but Jesus got him up. Carl died of SIDS. The pain and hurt cannot be written, neither can the love we felt from all who were around us. The Lord gave, the Lord hath taken away, blessed be the name of the Lord. We have felt the prayers and know God is with us and is touched by our grief. We also know Carl is safe, and we will see him again. People say it is not fair, and at times it may seem that way, but it is not fair that we got to hold our baby, and love him for 3 months, when some never get to hold their babies at all. It's not fair that our baby was never suffering or had to go through any surgeries. It is not fair that we had the pleasure and joy of loving him and he us. Our sadness comes in waves. We as a family will never be complete this side of eternity, but how we thank God that He is in control, and that He makes no mistakes; and while we do not understand His ways, we can trust Him, for His ways are right. If I could go back to that day, when we found out Carl was on the way, and had someone just read to me these details that I wrote to you, and asked us “do you want to go through with it or not?” we would not have given up our time with Carl for anything in the world!!! !